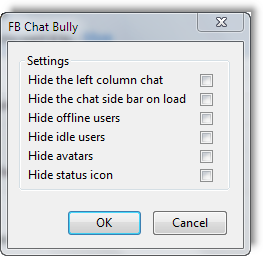 If you’re underwhelmed by the kludgy interface of Facebook’s native chat client, FB Chat Bully will help you tweak it, hide offline users, and more. Facebook's new interface of chat sidebar is found tricky by most of the users as they are massed up between Online friends and Offline friends. Also Idle friends are adding to the trouble. In this euphoria of migration to Google+, if you still like Facebook, or you don't want to loose friends by migrating to Google+ and yet want to change the Facebook sidebar look, here is the browser extension that may help you to sort out this confusion. 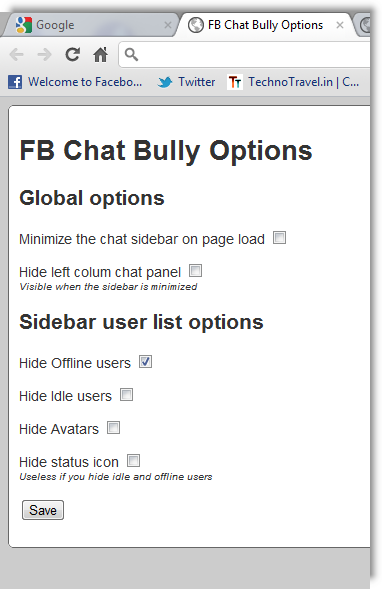 The extension that we will take a look is named "FB Chat Bully". This is a simple extension that will help you to figure out the Facebook sidebar the way you like. It has plenty customization options to help you out like Minimize the chat sidebar on page load, Hide left column chat panel, Hide Offline users, Hide Idle users, Hide Avatars, Hide status icon etc. This useful extension is available for the two most popular browsers Google Chrome and Mozilla Firefox. It has very easy to use user interface which will ease the things up. This is what the all extensions are for!It will look like below in Google Chrome. And in Mozilla Firefox, it will look like this. After the customizations, the Facebook Sidebar may look like below image. Chat names are not shown in the above image to keep privacy, but in real time it will definitely appear.